The assumption now widely held about Vladimir Putin's intentions concerning Ukraine are that his Spetsnaz infiltration forces, and the troops attached to Russian military intelligence (the old MVD), will continue to spread disorder and anxiety in Eastern Ukraine, encouraging pro-Russian separatists to go on seizing and fortifying municipal and other official buildings in eastern Ukraine towns. Russian television and other propaganda media will continue to promote the notion of a general rising in the region by citizens seeking reunion with Mother Russia, offering mass resistance to attack by the sub-standard Ukrainian army (such as it remains), now serving the "fascist" parliament installed in Kiev and backed up by U.S. Vice President Joe Biden, who has just arrived in Liev. This will be followed -- as this scenario of what President Putin plans, and how America will react, continues -- by the rescue of these pro-Russian citizens of what Mr. Putin, imitating the czars, now calls "New Russia," by the 40,000-man Russian regular army that has been waiting at the Russian-Ukrainian frontier to be turned loose. It will reconquer the Russian-speaking Ukrainian regions that were once ruled by the czars. Minor and rapid clean-up operations will follow to collect the Baltic States, Georgia, and possibly Armenia and Azerbaijan, with a few other lost territories, into the New Russia and its new Eurasian economic alliance. This will all be done with dazzling speed and efficiency, while Barack Obama and the American Congress stand frozen by uncertainty, and NATO is able to rally only Poland, which is not enough. Sanctions will be tightened. At Fort Bragg, the 82nd Airborne Division will rehearse an opposed drop-and-deployment operation and be put on 48-hour stand-by, only to be stood down at the end of the week. European press reports say the eastern Ukraine's cities seem to be functioning as usual, while the Spetsnaz and MVD "little green men," as the population has nicknamed them, mingle with local enthusiasts occupying government buildings fortified behind trash and old tires, and hang about having their pictures taken by both Russian and Ukrainian propaganda photographers. Thus far the only real action has been at the town of Sloviansk, under the control of local pro-Russian militants for the last two weeks. At a roadblock manned by the militants a firefight took place Saturday night with the occupants of two civilian vehicles. The three bodies of those found afterwards included two militia-men pulled from the nearby Donetsk River, one of which is reported to have borne marks of torture. 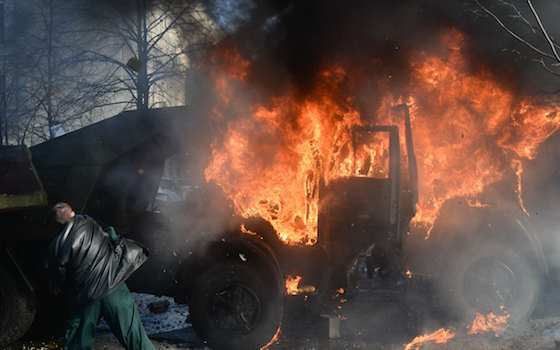 On the front seat of one of the burned-out cars someone had left -- "marvelously intact" a witness says -- what is purported to be the professional card of the leader of Pravy Sektor, a right-wing political faction in Kiev, together with papers and arms "of foreign manufacture." Journalists were not allowed to interview the hospitalized survivors, but the local chief of the separatists messaged Vladimir Putin asking for the urgent dispatch of Russian troops to defend Sloviansk from fascism. Moscow replied that Mr. Putin was indignant to hear of the attack. The Paris daily Le Monde [22/4] reports that a "reliable" poll finds that 69.7 percent of the inhabitants of the Russian-speaking southeast of Ukraine are opposed to attachment to Russia (15.4 percent are in favor). However, 74 percent are also angry about the "Maidan" coup in Kiev that overthrew the existing government, and consider the new American-sponsored government illegitimate, hostile to them and to their aspirations. This seems consistent with other reports from the Russophone region, where the majority seems anxious to be left alone by both sides. A correspondent of the conservative Le Figaro, Adrien Jaulmes in Donetsk, reports [22/4] that what is taking place in the contested Russia-speaking areas resembles a "Potemkin" war, waged in the press and social media and on wall posters, but which has yet to produce any discernible popular movement. A dozen or so people have been killed in random incidents, and the situation is explosive, as the Sloviansk episode shows, but so far the "war" itself remains virtual, and the old existing civic administrations go on as before, ignoring the pro-Russian takeovers of civic buildings. He says that the Kiev authorities have committed error after error, alternating belligerent statements with overdue concessions, and are blamed for the disorder, while the pro-Russians, who are really responsible, play victim and loudly call for help from Moscow. In Crimea, meanwhile, the New York Times reports that all is chaos, and that Crimea's people expect it will take two or three years before the Russian takeover is sorted out and people can live normal lives. In all, it doesn't seem quite the time for either side to turn this virtual war in Ukraine into a real one. One hopes that the advisers of both Presidents Obama (including Joe Biden) and Putin have grasped that. But probably one group or the other has not. It's an old army maxim, explaining disasters, that "there's always 10 percent that didn't get the word." "Ukraine: Not Time to Turn Virtual War into Real One"